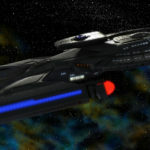 With only a few minor incidents (including a series of holodeck glitches resulting in some mild injuries – and one not so mild) the USS Avandar made the trip through the artificial anomaly discovered on the crew’s first mission, ending up once more on the far side of Romulan space – this time on purpose. With no wasted time, the crew got to work doing the job Starfleet sent them out there to do and began their efforts to map and study this new and mysterious area of space. In very short order, amongst the more mundane data gathered, they discovered an unidentified radio transmission coming from a nearby dead world. Whilst it proved impossible to gauge how old the transmission was, it seemed to be a beacon of some kind, and closer investigation of the planet showed the remains of a long-extinct civilisation.